Montessori is an approach to the education of children. It is a way of looking at, and understanding, children. It is a view of how children develop and learn which has been translated into a systematic method of education based upon careful scientific study. The Montessori educational system is unique in that it has successfully undergone continued development for over ninety years and has been used effectively with mentally retarded, physically handicapped, normal, and gifted children in different countries around the world. Perhaps the most significant reason for its success is that it is a comprehensive method of education resulting from an integration of research on development, learning, curriculum, and teaching. In the Montessori view of education, the purpose of education is to serve as an aid to life. Therefore, Montessori is an approach to education based upon the principle that schooling should work with the nature of the child instead of against it. Therefore, education should be based upon scientific study of the child and a resulting understanding of the processes of development and learning. Dr. Montessori felt that her greatest discovery was that children’s play actually consisted of the important work of development. In fact, children have a natural drive to work in order to develop. The child’s great task is to create an adult. As a result, children are not content unless they have an opportunity to develop and learn. Since Montessori schools are based upon the principle that “…the child, not the teacher, is the construction of man, and so of society…” it is felt that the, “human teacher can only help the great work that is being done…” “Education is not what the teacher gives; education is a natural process spontaneously carried out by the human individual, and is acquired not by listening to words, but by experiences upon the environment.” Therefore, the teacher’s job is to provide the materials and environment which will aid development and to be ready to respond when help is needed. What is the Montessori concept of “freedom”? Freedom is a goal, not a starting point. A free child (or adult) is one who has developed his potential and prefers to work out problems for himself but is capable of asking for and receiving direction when necessary. An undisciplined and unskilled child is not free but is a slave to his whims and moods and is excessively dependent on others. The free child, of course, grows into the free adult. Montessori discipline is an “inner discipline” – control which the child develops over his own behavior through his interest in the Montessori environment and materials. Dr. Montessori noted that many so-called undisciplined children were really frustrated by lack of proper stimulation and would become happier and self-controlled after a period of time in a Montessori class. Teaches to individuals as well as to groups. In many other classrooms, lessons are presented to the whole class and sometimes to small groups. In Montessori schools the general rule is reversed. Most of the time the teacher presents lessons to individuals. Other children can watch if they are interested. In this way, the teacher can address the specific needs of a child and can respond to that individual child’s interest and level of understanding. The child does not have to sit through something for which he or she is not ready. This individual attention also helps the teacher be much more familiar with the child. Thus, the teacher understands the child more fully, and better provides for that child. At the same time, it is important for children to feel a part of a group, and to learn how to be a contributing member of a group. Therefore, cooperative and collaborative group work is also encouraged as appropriate. Children learn through work rather than through listening and having to remember. In many non-Montessori classrooms children are expected to learn by listening to the teacher. Work is usually with paper and pencil. In a Montessori classroom, on the other hand, children learn by practicing with apparatus which embodies the concept to be mastered. For example, when learning about shapes such as triangles, squares, circles, etc., instead of listening to a teacher talk about the shapes and watching her draw them on the chalk board, the children trace real figures and use them to make designs. The Montessori curriculum is much broader than many other programs. The Montessori program teaches more than just the basics. First of all, it has exercises to develop the child’s basic capacities – his or her ability to control movement (motor development), to use senses (perceptual development), to think (cognitive development), to intend (volitional development), and to gain conscious awareness and control of emotions (affective or emotional development), to use language (language development), to belong, have friends, and be a contributing member of a group (social development), and have an ability to distinguish between appropriate and inappropriate behavior (moral development). In this way, the program helps the child become a competent learner. This develops independence and responsibility. In addition, the curriculum also helps the child develop a strong foundation in the language arts and math, and engages children in an in-depth study of physical and cultural geography, zoology, botany, physical science, earth science, astronomy, history, art, music and dance. In addition, children further learn practical skills for everyday life such as cooking, carpentry, and sewing. But, more than this, they learn how to be contributing members of a social community. With regard to discipline, in a Montessori program the emphasis is on self-discipline developed through helping a child learn how to appropriately meet needs rather than attempting to control a child through the use of reward and punishments. The emphasis is on teaching skills, and developing children socially, emotionally, morally, and volitionally. Montessori teachers are trained to teach respect and positive values through their modeling as well as through the way they teach. The Montessori method of helping a child is through a process of showing a child what to do in a positive manner. Montessori teachers attempt to avoid “put downs” or sarcastic comments, and try not to humiliate or embarrass the child. The Montessori program is systematic and carefully sequenced according to principles of development. Every activity is carefully thought out to build upon previous preparation and to lead the intelligence on to a higher activity. The Montessori program is designed to develop independence and responsibility. The organization of the classroom, the method of teaching, and the practical life lessons are oriented toward helping the child become a self-sufficient and disciplined individual. The routine of the Montessori program is based upon the principle of freedom of choice rather than on set times for prescribed activities. Since everything in the Montessori environment is something planned that is worthwhile and educational, the child can be free to work by choosing what best fits his or hers needs and interests. In the Montessori programs children are viewed as positive beings whose primary aim is the work of constructing a competent adult. Rewards and punishments, therefore, can only get in the way. Development and learning by themselves are adequate motivators. Likewise, children do not need to be appealed to through fantasy, bright colors, or gimmicks, as theses things come between the child and real learning. Therefore, joy is discovered and experienced in the real world through the study of nature, science, math, music, reading, history, and geography rather than in a world of comics, cartoons, and fantasy. Imagination develops through concrete experience, development of in-depth knowledge, and freedom to use one’s mind. Please click here to see an outline of the Montessori Curriculum. Competence: Children in Montessori schools are often several years above grade level in their basic skills. Also, since the Montessori education is comprehensive, children are often exceptionally knowledgeable in a number of other areas as well. Self-discipline: Montessori schools are well known for children’s development of self-discipline. Children choose to work long and hard. They treat materials and others with respect. They display patience, and resistance to temptation, and the ability to attend for long periods. Social Adjustment: Montessori school children usually strike a visitor as friendly, empathetic, and cooperative. The classroom is a cheerful social community where children happily help each other. It is not uncommon to see a child offer to help another child. Also, learning social grace and courtesy are a part of the Montessori curriculum. Happiness: Most parents of children in a Montessori school comment on how much their children love school. Dr. Maria Montessori, internationally renowned child educator, was originally a medical doctor who brought the scientific methods of observation, experimentation, and research to the study of children, their development and education. As a doctor, Montessori came to believe that many of the problems of the children with whom she was working were educational rather than medical. In examining education she felt that children were not achieving their potential because education was not based upon science. Her first step, then, was to attempt to abandon preconceived ideas about education and to begin to study children, their development and the process of learning through scientific methods of observation and experimentation. In doing so, she made what she considered to be a number of startling discoveries. Through her research, she discovered that children possessed different and higher qualities than those we usually attribute to them. What is a Montessori Preschool like? Children love a Montessori preschool. They like the opportunity to be with other children of their own age, and they like having so many interesting things to do. The room is attractive, with many carefully designed materials and activities from which the children can choose. The children are free to engage themselves in activities that interest them. They can work by themselves, or with a friend, or a group of friends. They can spend as much time as needed in any activity. They have opportunities to do things they see their parents do at home. They can prepare food such as grating carrots, peeling potatoes, cutting bananas, cracking nuts, or squeezing oranges. They can do carpentry such as hammering, nailing, and sawing. They can learn to tie shoes, work a zipper, use snaps and buttons. They can listen to music, sing, dance, and learn to play an instrument. They can paint, draw, work with clay, learn to sew, or make masks or puppets. They can learn to count or make words. They can look at books about all the wondrous things in the world around them. They can look at a globe and look at pictures taken of different parts of the world. And, they can run climb, play games, and have fun with their friends. What is a Montessori Elementary classroom like? A Montessori classroom is an exciting place to be. There are many interesting and beautiful resources with which the children can work. There are many interesting books on a wide assortment of topics such as on insects, plants, animals, different countries, history, etc.. However, textbooks, workbooks, and ditto sheets are not used. Instead, children work with many different concrete materials which help them to learn through an active process. In using these materials the children may make their own books, draw their own maps or time lines, and develop their own projects. As a result, the classroom is a busy, happy place to be. Since the classroom is well organized, with the intention of making all the materials visible and accessible for the children, the children can find what they want and work without having to wait for the teacher. Some children may be reading while others are doing math. Some people may be studying about ants while others are listening to classical music on headphones. The children are all engaged in purposeful activity which leads and develops the intelligence. The materials set out in the room have been carefully designed with an educational purpose in mind. Because of this, the children are free to move from activity to activity. They don’t need to wait for assignments from the teacher. Meanwhile, the teacher is free to help individuals or small groups. The teacher is not tied to a routine of having to present a series of large group lessons to the whole class. The classroom is activity-centered rather than teacher-centered. The teacher’s job is to prepare the classroom, set out the materials, and then observe the children and determine how to help. The teacher does not need to test the children because it is easy to see how they children are doing by observing their activities. In this way, the teacher can have immediate, up-to-date information about any child without time being taken way from learning and without threat of failure being imposed upon the child. Without the threat of failure, and with so many intriguing things to do, discipline problems disappear and a friendly, cooperative social community forms. Cooperation rather than competition becomes the tone of the room and adversarial relationships disappear, becoming friendships. Is the Montessori Method being used in public schools? The Montessori method is now being used in many public, as well as private schools. An increasing number of public school teachers are discovering the Montessori method of education. Many teachers find that the Montessori approach provides support for what they have intuitively been trying to do. These teachers are excited about Montessori practice because it gives them specific materials and techniques which make it easier to work with. Part of the Montessori method is an emphasis on the child as a ‘child of the world.’ Montessori is an inclusive view of community and society and as such is extremely appropriate as a public school method. The self-directed nature of the Montessori method seems appropriate for pre-schoolers and even Kindergarteners, but there is specific knowledge that Elementary children must learn. What if an Elementary Montessori child never becomes interested in handwriting or fractions, will s/he never learn those things? How does the Montessori teacher ensure that the students learn even the things they are not drawn to? Elementary Montessori is not without structure. Different schools and different teachers will have their own way of doing classroom management, but usually a contract is made between each student and the teacher each week. The contract is a written form of records that the child fills out as he completes his required work and gets teacher sign off. Upon entering the class in the morning the schedule is on the board so everyone has some direction as to what to do and of course there is continuity so the children know what to expect and can be held accountable. Throughout the day, the children have a good idea of where they are at in fulfilling their responsibilities. Each individual receives the guidance of the teacher as what are appropriate ways to get their work done. Some children require daily guidance, while weekly review and consequences work for other students. Consequences for not fulfilling the weekly contract may look like this: “Since you chose to visit your friends over getting your work finished then you have also chosen to stay in and work while the rest of us go to….” The consequences are pre-arranged so there are no surprises to the student and are often part of the contract. I thought Montessori schools were religious schools? There is no religious content in the Montessori curriculum. Although some private Montessori schools have a religious affiliation, most do not. All public Montessori schools are non-sectarian as required by law. The Montessori method was created a century ago; is it applicable today? 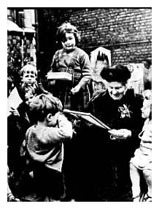 While appropriate changes have been made to the original Montessori curriculum (including the introduction of computers and modifications to the Practical Life exercises to keep them culturally relevant), the basic tenants has not changed much since Dr. Montessori’s lifetime because the developmental stages of humans have not changed. Furthermore, contemporary research and evaluation are confirming many of Montessori’s insights, a major example of this is in the area of brain-based research. How do Montessori children do in the ‘real world’? Research studies show that Montessori children are well prepared for later life academically, socially and emotionally. In addition to scoring well on standardized tests, Montessori children are ranked above average on such criteria as following directions, turning in work on time, listening attentively, using basic skills, showing responsibility, asking provocative questions, showing enthusiasm for learning, and adapting to new situations. The habits and skills which a child develops in a Montessori classroom are good for a lifetime. They will help him/her to work more effectively, to observe more carefully and to concentrate well no matter where s/he goes. Research shows that the best predictor of future success is a sense of self esteem. Montessori programs, based on self directed, non competitive activities, help children develop good self images and the confidences to face challenges and change with optimism.